The Emergency Committee for Israel (ECI) is a neoconservative pressure group launched in July 2010 to promote militarist, “pro-Israel” U.S. policies. A frequent ECI tactic is to publish advertisements that attack politicians who question one-sided U.S. support for Israel. It also publishes open letters to political figures and hosts a website that provides information about political races and highlights ECI’s concerns regarding Israel’s security. ECI has also operated a political action committee (ECIPAC) to lobby on behalf of its preferred policies. An early financial backer of ECIPAC was Daniel Loeb, a registered Democrat and well known hedge fund manager who gained attention in 2012 when he helped raise money for the Mitt Romney presidential campaign. According to FEC filings, in 2010, Loeb was the ECIPAC’s largest donor, giving $100,000. Like most members of the “Israel Lobby” in the United States, ECI has promoted a hardline U.S. stance on Iran’s nuclear program. In late 2013, the group released a video entitled “Obama’s March to War” that selectively incorporated apparently contradictory statements by President Obama on a host of issues. The video then ended with Obama stating during a presidential debate with Mitt Romney that Iran will not get a nuclear weapon during his presidency, which was immediately followed by a nuclear detonation and a mushroom cloud. The legislation referred to in the press release was cosponsored by Sens. Robert Menendez (D-NJ) and Mark Kirk (R-IL) in 2013, and heavily promoted by leading members of the Israel Lobby, including the American-Israel Public Affairs Committee (AIPAC). However, when the bill’s supporters failed to enlist enough Democrats to sign on to the bill, AIPAC made a surprise announcement in early 2014 that it thought it would be premature to bring the new sanctions bill up for a vote. This announcement, which was subsequently retracted by AIPAC only 24 hours later, spurred heated criticism from other members of the “pro-Israel” crowd, including ECI’s William Kristol, who made a veiled accusation that AIPAC was sacrificing the effort to prevent a nuclear-armed Iran with the goal of maintaining its own bipartisan connections. "It would be nice if there were universal bipartisan support for acting now to stop a nuclear Iran," said Kristol in an ECI press release. "But there apparently is not. And it would be terrible if history's judgment on the pro-Israel community was that it made a fetish of bipartisanship—and got a nuclear Iran. During the summer 2014 Gaza War, ECI strongly criticized the Obama administration for allegedly failing to denounce Hamas and undermining Israel. “Obama and Kerry must change course. They must stop pressuring Israel to stop fighting a just and necessary war. They must stop demanding Israeli concessions to Hamas. And they must start supporting an Israeli victory over terror that could free Gaza from Hamas and bring a real and lasting peace,” read an August 2014 ECI press release. During the 2014 Israeli-Palestinian peace talks initiated by Secretary of State John Kerry, ECI lambasted Kerry for raising the prospect of Israel turning into an “apartheid state.” An April 2014 ECI statement called for Kerry to resign his post and even called for former secretary of state and 2016 Democratic presidential candidate Hillary Clinton to rebuke Kerry’s remarks. “It is time for John Kerry to step down as Secretary of State, or for President Obama to fire him. And it would go a long way toward repairing the damage Kerry has done if his predecessor as Secretary of State, who is the likely Democratic Party nominee for president, explained why this kind of rhetoric had no place in her State Department and why it will have no place in her presidential campaign,” the statement read. ECI strongly supported the 2014 Senate campaign of then-Rep Tom Cotton (R-AR), who ultimately won his race. Cotton was reported to have received a million-dollar contribution in the form of supportive political advertising from ECI. Other hardline "pro-Israel" figures—like casino-mogul Sheldon Adelson, hedge-fund billionaire Paul Singer, and former Romney foreign policy adviser Dan Senor—also supported Cotton's successful Senate bid. ECI has also targeted a number of political figures and liberal groups through ad campaigns. In early 2013, for instance, the group emerged at the forefront of a neoconservative effort, which was orchestrated in part by Kristol, to sink Barack Obama’s nomination of former Sen. Chuck Hagel (R-NE) to head the Department of Defense in early 2013. Using language similar to an op-ed published by Kristol, ECI launched advertisements accusing the Vietnam veteran Hagel of being weak on Iran and hostile towards Israel. The NYT ad seems to have been part of what the New Yorker termed a “two-pronged maneuver … to intimidate critics of Netanyahu” and “to damage Obama.” The second prong in this effort was the launch of a 30-minute video titled “Daylight: The Story of Obama and Israel,” which attacked President Obama’s treatment of Israel. According to the New Yorker, the video—which showed the president interacting with Palestinian Authority President Mahmoud Abbas as well as with Turkish students, saying he wants “to make sure that we end before the call to prayer”—aimed to demonstrate that Obama “is biased against Israel and in favor of the Palestinians” and to insinuate that he may be Muslim. At roughly the same time as the video release, ECI ads began appearing at bus stops in Washington, D.C., displaying a picture of Obama with the text: “He says a nuclear Iran is unacceptable. Do you believe him? Do they?” Underneath the text were pictures of Ayatollah Khamanei and Iranian President Mahmoud Ahmadinejad. Unlike earlier neoconservative-led endeavors (like the Project for the New American Century) that made alliances with hawkish elements in the Democratic Party, ECI is a decidedly right-wing affair. ECI board members have included William Kristol, editor and founder of the Weekly Standard and cofounder of the Foreign Policy Initiative; Rachel Abrams, the wife of the convicted Iran-Contra veteran Elliott Abrams who passed away in 2013; and Gary Bauer, a well-know Christian Zionist who leads the lobby groups American Values and Keep Israel Safe and serves on the executive board of John Hagee’s Christians United for Israel. ECI’s initial director and apparently sole employee is Noah Pollak, a relative neoconservative newcomer who has worked for Commentary, the Middle East Forum, and the Sheldon Adelson-supported Shalem Center in Jerusalem. According to one observer, Pollak frequently uses Twitter to make arguments that seem to be taken from the talking points of the Israeli Defense Forces. Additional ECI principals have included Michael Goldfarb, a former writer for the Weekly Standard and vice president of Randy Scheunemann’s Orion Strategies—which apparently initially housed ECI— who serves as an adviser; and Margaret Hoover, a long-standing Republican Party figure who served under Karl Rove in the George W. Bush administration and initially owned the domain name used by ECI’s website. Hoover is the great granddaughter of Herbert Hoover and a right-wing pundit and blogger. 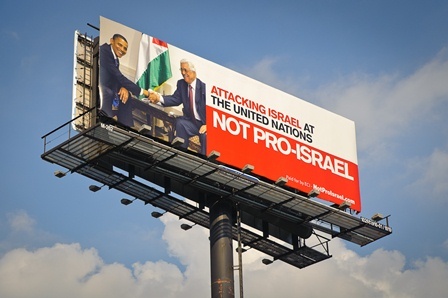 FEC, “Emergency Committee for Israel PAC,” 2010,http://query.nictusa.com/cgi-bin/com_ind/2009_C00490409; see also, Eli Clifton, “Disgruntled Hedge Fund Managers Bankroll The Emergency Committee For Israel’s Attack Ads,” ThinkProgress, June 2, 2011,http://thinkprogress.org/security/2011/06/02/234474/hedge-fund-managers-eci-obama/. Adam Kredo, "Obama's March to War: New ad casts doubt on Obama’s promise to stop Iran," Washington Free Beacon, November 14, 2013, http://freebeacon.com/obamas-march-to-war/. ECI, “ECI Statement on the Implementation Agreement with Iran,” January 12, 2014,http://www.committeeforisrael.com/implementation. Jim Lobe, "Menendez, AIPAC Beat Tactical Retreat," LobeLog, February 6, 2014, http://www.lobelog.com/menendez-aipac-beat-tactical-retreat/. Jim Lobe, "A Flailing AIPAC," LobeLog, February 7, 2014, http://www.lobelog.com/a-flailing-aipac/. ECI, “ECI Statement on Stopping a Nuclear Iran,” February 7, 2014, http://www.committeeforisrael.com/stop. Noah Pollak, “ECI Statement on Iran Framework Agreement,” Emergency Committee for Israel, April 2, 2015,http://www.committeeforisrael.com/deal. Noah Pollak, “ECI To Host Reception Honoring PM Netanyahu During His U.S. Visit,” Emergency Committee For Israel, January 22, 2015, http://www.committeeforisrael.com/statement_on_prime_minister_netanyahu_s_trip_to_the_u_s. Noah Pollak, “ECI Statement on the Hamas-Israel war,” Emergency Committee for Israel, August 1, 2014,http://www.committeeforisrael.com/eci_statement_on_gaza. Noah Pollak, “ECI Statement: Time for Kerry Go,” Emergency Committee for Israel, April 28, 2014,http://www.committeeforisrael.com/kerry. Eli Clifton, “EXCLUSIVE: Emergency Committee for Israel Spends Big on Rep. Cotton,” LobeLog, November 4, 2014,http://www.lobelog.com/exclusive-emergency-committee-for-israel-spends-big-on-rep-tom-cotton/. Kenneth Vogel, “Bill Kristol’s big plans start with Chuck Hagel nomination,” Politico, January 7, 2013,http://dyn.politico.com/printstory.cfm?uuid=561888D3-6C70-47A5-B337-059723C35A6C. Emily Hauser, The Anti-Hagel Campaign Was Never About Israel,” Daily Beast, January 7, 2013,http://www.thedailybeast.com/articles/2013/01/07/the-anti-hagel-campaign-was-never-about-israel.html. ECI ad, New York Times, March 1, 2012, http://www.committeeforisrael.com/wp-content/uploads/2012/02/CAP-MM-NYT.jpg. Both quotes cited in Paul Berger, “Campaign Succeeds in Stirring Charity Pot,” Forward, March 16, 2012,http://forward.com/articles/152682/campaign-succeeds-in-stirring-charity-pot/. Paul Berger, “Campaign Succeeds in Stirring Charity Pot,” Forward, March 16, 2012,http://forward.com/articles/152682/campaign-succeeds-in-stirring-charity-pot/. Connie Bruck, “The Emergency Committee for Israel Cries Wolf,” New Yorker, March 5, 2012,http://www.newyorker.com/online/blogs/newsdesk/2012/03/the-emergency-committee-for-israel-cries-wolf.html#ixzz1p17ufPnw. Phillip Weiss, “Emergency Committee for Israel fires pro-war propaganda blast at Obama,” Mondoweiss, March 1, 2012, http://mondoweiss.net/2012/03/emergency-committee-for-israel-fires-pro-war-propaganda-blast-at-obama.html. ECI, " ECI Letter to Senators Schumer and Levin,” December 1, 2010, http://www.committeeforisrael.com/uncategorized/eci-letter-to-senators-schumer-and-levin/. Daniel Luban, " Fact-Checking Noah Pollak and the IDF’s Unofficial Spokespeople,” Lobelog, Inter Press Service, January 6, 2011, http://www.lobelog.com/fact-checking-noah-pollak-and-the-idfs-unofficial-spokespeople/#more-7309. Justin Elliot, “Bill Kristol's new Israel group using offices of old Committee for the Liberation of Iraq,” Salon.com, July 16, 2010,http://www.salon.com/news/politics/war_room/2010/07/16/liberation_of_iraq_and_committee_for_israel/index.html. Eli Clifton and Jim Lobe, “Emergency Committee Based at Old Committee for the Liberation of Iraq,” Inter Press Service, LobeLog.com, July 15, 2010, http://www.lobelog.com/emergency-committee-based-at-old-committee-for-the-liberation-of-iraq/. Justin Elliott, “Bill Kristol’s new Israel group using offices of old Committee for the Liberation of Iraq,” Salon.com War Room, July 16, 2010, http://www.salon.com/news/politics/war_room/2010/07/16/liberation_of_iraq_and_committee_for_israel/index.html. Jim Lobe, “Palin’s PAC Also Employs Scheunermann,” Inter Press Service LobeLog.com, July 17, 2010,http://www.lobelog.com/palins-pac-also-employs-scheunemann/. CNN Transcripts, “Campbell Brown: Immigration Showdown; President Obama Meets With Israeli Prime Minister,” CNN, July 6, 2010, http://www.cnnstudentnews.cnn.com/TRANSCRIPTS/1007/06/ec.01.html. Shmuel Posner, “Noah Pollak on ‘cynical participants in the international lynching of the Jewish state,’” Jerusalem Post, July 15, 2010, http://cgis.jpost.com/Blogs/rosner/entry/noah_pollak_on_cynical_participants. Ben Smith, “Group to oppose President Obama's Mideast policy,” Politico, July 12, 2010,http://www.politico.com/news/stories/0710/39613.html.